During his very first of 10 Contiki Holidays trips to date as the company’s CEO, Casper Urhammer met a young traveller who had saved for four years working at a Subway sandwich shop to buy a camera and a Contiki tour, reports Ann Ruppenstein in this week’s digital edition of Canadian Travel Press. Coming from outside of the industry, Urhammer, an avid motorcyclist and former adrenaline junkie with over 1,000 skydives to his name, racked up 225 days of travel in his first year on the job. Moving forward, he says his three main priorities are the continued focus on operations, marketing and technology. In the second quarter Contiki will launch a new website, which will include user generated content from real vacationers. 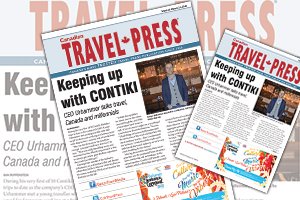 This month the youth travel brand launched the Freedom Guarantee, which gives travellers the flexibility to change their trip date or tour with zero change fees within 45 days of departure or to transfer deposits as credit for another Contiki tour through the FlexDeposit policy.